Despite living in London on and off for all my life, I have never visited Kenwood House. I still haven’t actually, but I did join a group of friends in its grounds tonight for a wonderful ‘Last Night of the Proms’ concert and picnic. The weather was kind. The food was delicious. The PA announcements before the show were amusing – (There is only so much humour you can wring out of telling people that the show is being sponsored by a cider company, but the announcer managed pretty well) The music was sublime. I didn’t think I’d like Kathryn Jenkins, but she was absolutely superb. All in all, a tremendous evening. Thank you, David for organising it! 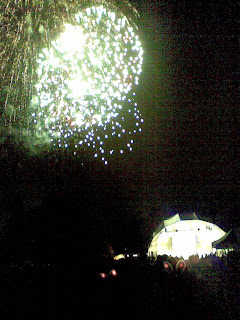 And, despite press warnings that they weren’t going to be allowed because local residents had refused permission, we did have fireworks at the end. Wonderful. Oh yes, if you look very closely at the photo taken from my camera, you can just make out the flashing bunny ears of the two ladies sitting in front of our party. They added just that extra bit of fun to what was already a splendid evening’s entertainment.